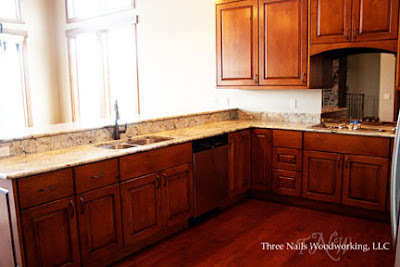 At Three Nails Woodworking, we offer a custom piece of cabinetry. 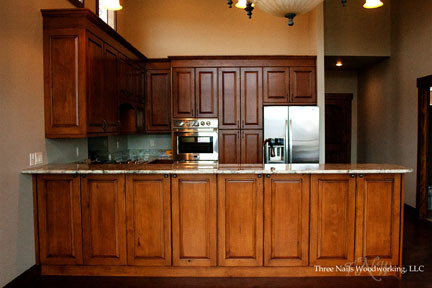 We manufacture our cabinets completely in our shop using the finest materials and craftsmanship. This gives us complete control of quality from start to finish. For example, we are able to give you a higher quality door with a 3" stile as a standard feature. This provides a classier, truly custom look. Our doors are made with solid 13/16" material for a thicker, more beautiful door. We use the highest quality BLUM hardware including softclose full extension drawer slides and soft close door hinges. These extra touches, which are standard features, set us above the competition, yet our prices are still less than the box stores. 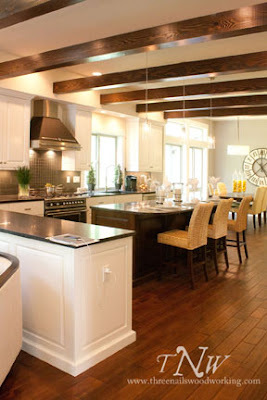 We truly believe in offering the best to our customer, yet keeping it affordable. 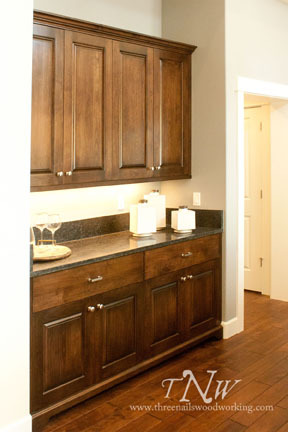 Our finishes are exceptional. 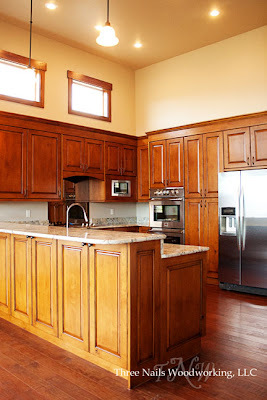 We apply our 17 years of knowledge and experience to your cabinets to provide a wonderfully silky feel and look with an incredible durability. 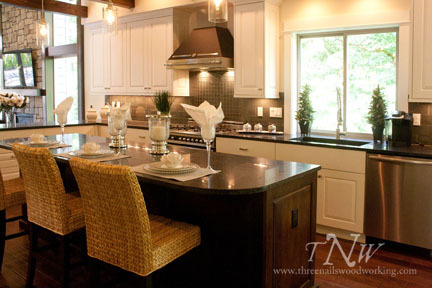 The luxurious look and feel of our finish is not even comparable to the lifeless finish created by mass production. We don't cut corners. We do the job right in the first place. Customer service is extremely important to us. Our customers are highly satisfied with us, so much so that we don't advertise, we rely nearly completely on word of mouth referrals, and yet we have been busy entirely through ups & downs in the economy and housing market. We send work all over Washington state and Idaho, and can even ship to areas outside our region. Please let us know if you are interested in having us do your work beyond North Central Washington. Contact us today for your cabinetry bid.